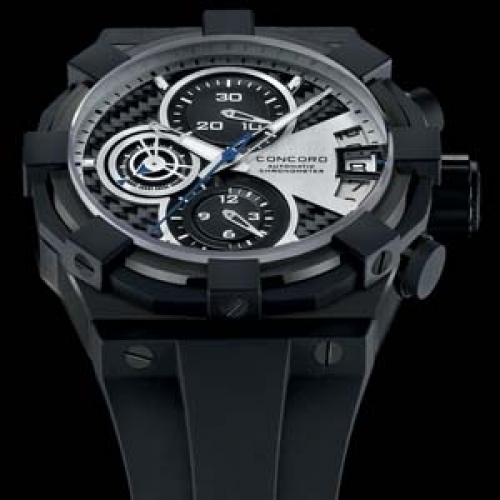 This all black CI chronograph radiates unequivocal power: its ultra-complex case comprising 53 elements and measuring 44 mm diameter and 16.7 mm thick features a black PVD coating, a protective ring with self-locking screws and paws surround the bezel. These bastions guardians shelter a spectacular 3.3 mm thick sapphire crystal that appears to literally spring out of the dial, revealing a triple-layer carbon structure with the signature Concord seconds disc. This self-winding COSC-certified chronograph will delight thrill seekers.